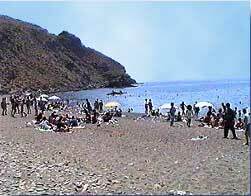 The beach is sandy and pebbled and it's main characteristic is the very cold water and the deep bottom of the sea. 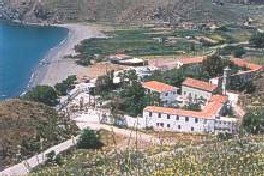 At the end of the coast there is a path, which leads to the place where Agia Markella died a martyr. From this point hot water is welled out from the earth. 22 of July is the date that Chian people, we celebrate the name -day of Saint Markella and many people from all over Greece come to the Island just to be in the monastery this saint day to pray and thank the Saint for the good she made to them and their families. Very often, the natives say stories about the miracles that Agia Markella had done when she was a young woman.